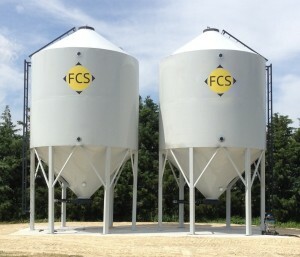 FCS mfg. is a steel fabrication business family owned and operated since the mid 1980’s. Located just off Hwy 58 in Greenwood County, the operation began when founder and President Jay Luthi built his first Overhead Cake Bin in his father’s farm shop. From there the business has continued to grow, building upon the desire “To meet the customer’s needs” and “Bringing their Dream to a Reality”. Originally named Machine Service, Inc., it was founded with several objectives that were wished to achieve and maintain. One, is to provide quality manufactured steel which will provide years of service to you our customer and secondly, to follow up on how that product is performing for you. At Machine Service we recognize that our product is a reflection of our workmanship, and we regard our customers as our greatest asset. Service to us means, satisfying you our customer in whatever roll it may require. We want to take pride in our workmanship and be responsible in whatever services we provide for you. The venture into Overhead storage business began with a request and has continued to grow. We fabricate a line of Overhead Bins with capacities ranging from 14-60 + tons or 550-2200 bushels. 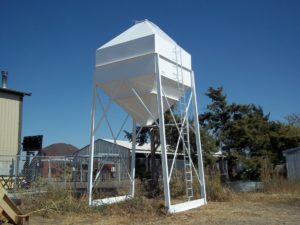 The bins were designed for any dry, flowable material such as seed or feed; but also accommodate heavier weight materials such as fertilizer, mineral, sand, or cement. Within the past 15 years, FCS has began building larger structures to meet the needs of the agriculture industry and an ever growing population to feed. 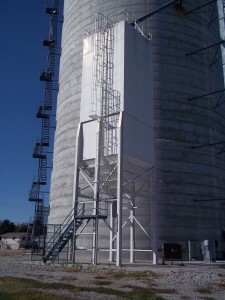 We have built Storage bins that hold over 5,00 bushels of material for Semi Loadout bins! We have also built bins with 6 separate compartments for multiple commodities! With the years of experience and expertise that FCS has, designing and building a custom storage bin is well within its capabilities. Their in-house engineering allow FCS to efficiently come up with design solutions for just about any storage issue. As the Agriculture industry continues to grow and evolve with different needs, new solutions and ideas are needed to solve current issues. In the past year, FCS mfg. brought out a new line of Round, Smoothwall hopper bottom bins to help handle the growing demand for more efficient storage. This line of products is an all welded design that cleans out easily, with no bolts or ribbing that might damage seed or leak.They are built in capacities of 500-5500 bushels. The same passion and energy that has made FCS a household name in the custom storage bin industry, is being put into this new line of products with the hopes of serving many more customers! We thank you for taking a few minutes to look over our website and appreciate the opportunity to serve you!